5.5 x 4.1 x 3.1 in. Sporting a new, higher-resolution 24MP sensor, a faster processor and a beefed-up 45-point AF system, the Canon 80D builds upon foundation laid out by the 70D and its excellent Dual Pixel CMOS AF technology. The 80D performs very well on multiple fronts, including better dynamic range and detail a lower ISOs, better higher ISO performance and more versatile autofocus. Despite a robust offering on the video side of things, it does lack a few of today's more popular features. Overall, the Canon 80D is still an excellent multimedia DSLR, but should it earn a spot in your camera bag? Available since March 2016, the Canon 80D sells body-only for an estimated retail price of US$1,199, with the EF-S 18-55mm f/3.5-5.6 IS STM kit lens for US$1,349, or with the new EF-S 18-135mm f/3.5-5.6 IS USM kit lens for US$1,799. We've just added a detailed look at the 80D's video quality, performance and a general overview its video-related specs and features. Click here to check out our Canon 80D Video Review. The Canon 70D was a milestone camera for Canon, as it introduced their impressive Dual Pixel CMOS AF technology, bringing camcorder-like video autofocus and fast, responsive viewfinder-like AF for stills to the world of DSLRs. While the 70D was a significant technological upgrade over its 60D predecessor, the new 80D successor builds upon the 70D's foundation with a host of improvements and updates, though perhaps not groundbreaking ones. Similar to the earlier Canon T6s, the heart of the new 80D is a 24.2-megapixel APS-C CMOS imaging sensor, which is a modest resolution increase over the 20.2MP chip in the 70D. Unlike the T6s, the 80D's higher-res sensor, not surprisingly, sports Dual Pixel CMOS AF technology. Paired with this all-new sensor is a faster DIGIC 6 image processor, up from the DIGIC 5+ of the 70D. The ISO range is relatively unchanged, however the native maximum ISO gets a small boost from 12,800 to 16,000. The maximum expanded ISO remains the same, though, at 25,600. The native ISO range for video mode, however, is set between 100-12,800, though it can be expanded to 25,600, too, should you need the extra boost. In addition to Dual Pixel CMOS AF, the new Canon EOS 80D sports some nice upgrades to traditional through-the-viewfinder autofocusing. First and foremost, the 80D gains a sizable improvement to the number of AF points, going from 19 to a healthy 45 all cross-type AF points. The coverage area of the 80D's new 45-point array has been expanded both horizontally and vertically to cover more of the frame compared to the earlier 70D. Speed and performance metrics remains similar to its predecessor, with the same 7fps continuous burst speed as before. It's not the fastest DSLR on the block, but 7fps is plenty fast for capturing crisp shots of action and sporting events in all but the most demanding of occasions. 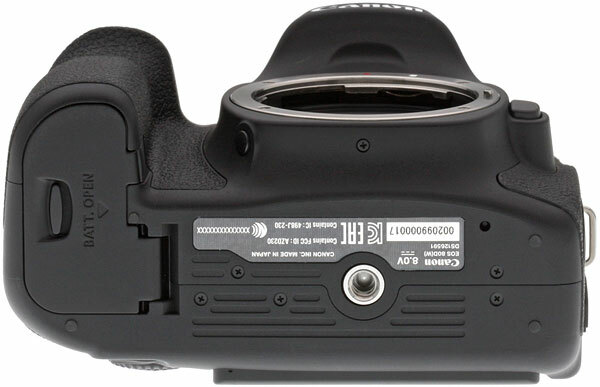 The 80D does gain the improved 7,560 pixel RGB+IR metering sensor from the T6s, which in addition to its metering functionality, works in conjunction with the AI Servo AF II autofocusing system to provide skin tone and color detection for better facial recognition and subject tracking. For sports shooters and others who capture fast action under indoor or flickering artificial lighting, the 80D helpfully gains the anti-flicker system that was first introduced on the 7D Mark II. With this system, the camera will be able to detect the fluctuating brightness cycle of artificial lights such as fluorescent lamps, and subtly adjusts the timing of the shutter release in single-shot mode or during a continuous burst of frames to capture images at optimal brightness. As for the physical build quality and design, the 80D appears, perhaps not surprisingly, nearly identical to its 70D predecessor. Sitting in the middle ground between the larger 7D-series cameras and the smaller, lighter Rebel series, the 80D's size and weight hits a nice balance between relative compactness and a comfortably-size DSLR for a variety of hand sizes. As before, the 80D provides a sizable handgrip with ergonomic contours and a highly textured rubberized coating for a comfortable, secure grip. Button and control placement is practically identical, including the characteristic row of setting adjustment buttons placed in front of the top-deck LCD panel for quick and easy access. 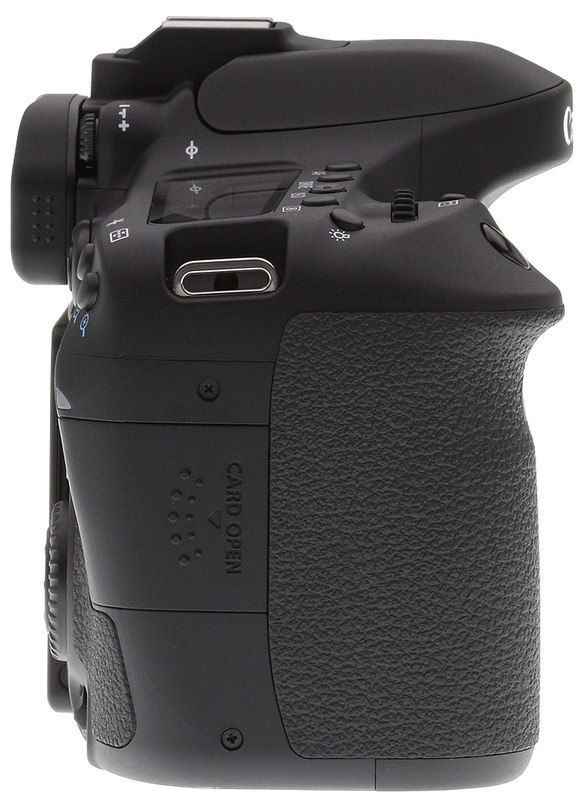 On the back of the camera, other than a couple of button design changes, the rear controls are in a nearly identical arrangement compared to the 70D. There are a few other notable tweaks the to external design, the first being on the PASM mode dial. 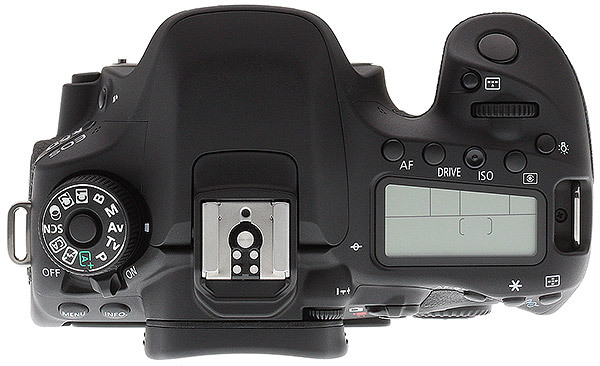 While maintaining the handy locking design, the 80D's mode dial now adds a second Custom Shooting Mode slot -- now designated with "C1" and "C2" icons -- which allows for added flexibility for quickly recalling your most-used shooting modes and settings. Also, the built-in stereo microphone openings have been helpfully moved to a forward-facing position on either side of lens mount. This seems like a more logical spot than the 70D's placement at the top-rear of the camera near the hot-shoe, though Canon recommends using an external microphone to avoid or otherwise reduce accidental lens operation and focusing noises from being picked up in your video's audio track. The 70D saw improvements to its optical viewfinder, which upped the field of view coverage to around 97% according to our lab testing (Canon's specs indicated 98% coverage). Now with the 80D, its pentaprism viewfinder performance increases yet again, as Canon's specs indicate approximately 100% field of view coverage. The viewfinder on the 80D also features the same 0.95x magnification and 22mm eyepoint as before. As with the earlier 70D, the 80D features a three-inch touchscreen LCD display with a convenient Vari-Angle articulated design, which is great for video recording as well as shooting in awkward positions and angles. The TFT LCD panel itself features 1.04-million dots of resolution, which is the same as the 70D, and includes 7-step adjustable brightness control and a smudge-resistant coating. The 80D outfitted with the new EF-S 18-135mm f/3.5-5.6 IS USM kit lens and the optional PZ-E1 Power Zoom Adapter and Canon DM-E1 Directional Stereo Microphone. Given the introduction of Dual Pixel CMOS AF technology on the 70D, it was clear that this DSLR was designed as more of a hybrid camera for both still images and video than perhaps earlier video-capable EOS cameras. The 80D continues this dual-purpose focus, with a strong emphasis on video performance. And while the 80D might not offer groundbreaking new video features, or even increasingly popular ones such as 4K resolutions, high-speed video modes or clean HDMI output, there are some welcomed improvements on the video front for the 80D. For starters, thanks to the DIGIC 6 processor, the camera now offers Full HD video capture up to 60p, making it much more versatile for capturing faster action video and other moving subjects. Of course, 30p and 24p options as well as the PAL-specific 25p and 50p framerates are also available for 1080p footage. Furthermore, the 80D now features Canon's HDR movie and in-camera time-lapse video modes, as well as a variety of real-time movie filters for additional creative options. The 80D offers a choice of video file formats and quality settings, but quality comes at a price, unfortunately. For the highest quality, videographers can choose the MOV file format, which uses 90Mbps ALL-I intra-frame compression. However, there's a caveat: only 30p and 24p (29.97 and 23.98 fps, respectively) framerates are available in this mode. To get 60p footage, you'll need to use MP4-format video, which uses IPB compression (at approximately 60Mbps for 60p video). Full HD IPB video using the MP4 format is also offered in 30p and 24p framerates, as well as 720/60p. IPB Light compression is also available for both 1080/30p and 720/30p, which can help extend the capacity of your memory card. The in-camera HDR movie mode produces a 1080/30p video using IPB-compressed MP4 video as well. According to Canon specs, both MOV and MP4 video recording is limited to a maximum of 29 minutes and 59 seconds, at which point video recording stops automatically -- and must be restarted manually. However, video can be continuously recording past 4GB file sizes without interruption prior to the 29:59 hard limit. One of the more welcome additions for video shooters, in our opinion, is the inclusion of a headphone jack. 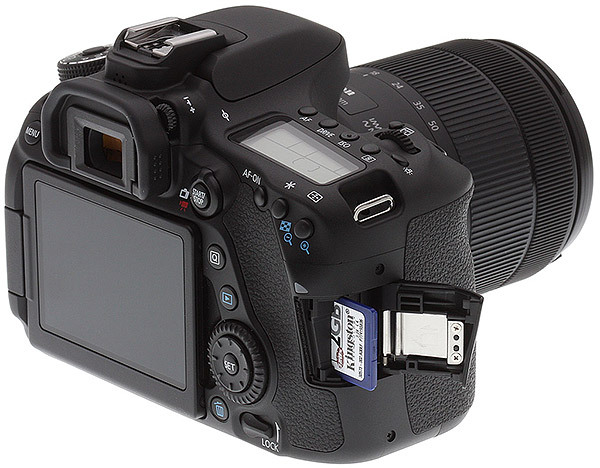 What was formerly reserved for the higher-end 5D Mark III and 7D Mark II, the 80D's headphone jack allows for the live monitoring of audio during video capture. 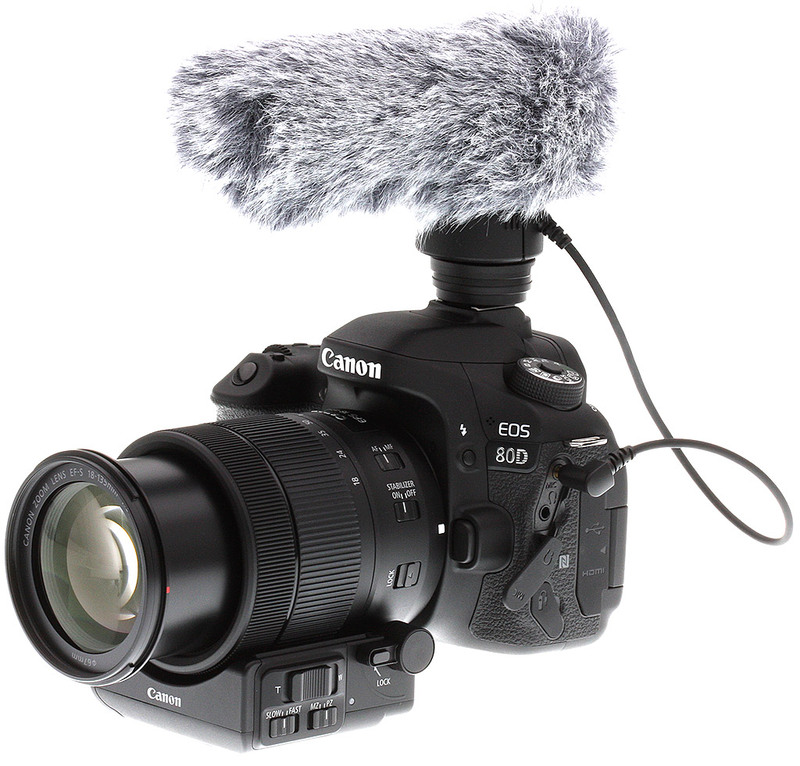 Combined with the 3.5mm microphone input jack, the expanded audio capabilities make the 80D a much more capable video rig than its predecessor. And while we're on the subject of audio capture, alongside the release of the 80D, Canon is debuting their first Canon-branded external microphone, the DM-E1. This hot-shoe-mounted directional stereo microphone can be tilted up and down from 90 to 120 degrees, includes a shock-mount design and comes with a fuzzy wind screen covering for additional wind filtering. This powered microphone draws its juice from a single "button-type" lithium cell battery. What would a camera be without a lens? With the new 80D, the camera is offered in a kit configuration with an all-new EF-S 18-135mm f/3.5-5.6 IS USM lens. 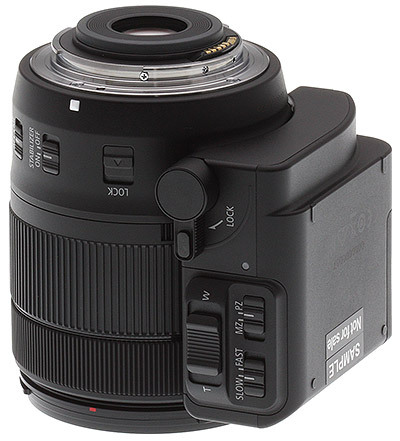 However, while this may sound like the typical longer-reaching zoom kit lens from years past, there are some unique features with this new model. For starters, this is the first Canon lens to utilize their new "Nano-USM" focusing motor technology. The Nano-USM technology should allow for the fast focusing speed for still photos that's characteristic of Canon's traditional USM or DC motor lenses, but also offers smooth and quiet focusing for video similar to an STM-based lens. It's the best of both worlds. According to Canon, the driving speed of the focusing lens is up to 4.3x faster at telephoto and 2.5x faster at wide angle than the previous 18-135mm STM lens. The new kit lens also features built-in optical image stabilization, with 4-stops of optical stabilization correction, according to Canon. Canon goes a step further in souping-up the video features of the 80D, though this could technically apply to any EOS camera, so long as you use the new 18-135mm Nano-USM lens. Sold as an optional accessory, the new Power Zoom Adapter PZ-E1 (shown at right) attaches to the base of the new 18-135mm lens, as you can seen in the image above, and offers smooth and quiet adjustable, powered zooming capabilities similar to a camcorder. Furthermore, the PZ-E1 is Wi-Fi-enabled, allowing for remote zoom control of the lens via the Canon Camera Connect smartphone app. As with the 70D, the new Canon EOS 80D features built-in Wi-Fi connectivity for easy photo and video transfers as well as remote control capabilities, but adds NFC (Near Field Communication), for quick and easy pairing with compatible devices. Using the EOS Remote app for iOS and Android devices, users can pair their smartphones to the 80D and quickly transfer media to their devices for social sharing. Plus, the app allows for remote shooting, with the ability to control shooting modes, exposure adjustments and tap-to-focus. 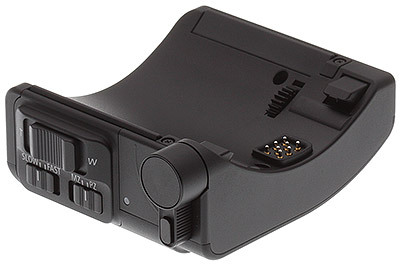 The 80D does not have a built-in GPS, unlike it's bigger brother the 7D Mark II, but the 80D is compatible with the GPS Receiver GP-E2 add-on accessory. You can then add location data to your images, and view GPS info in Playback mode. 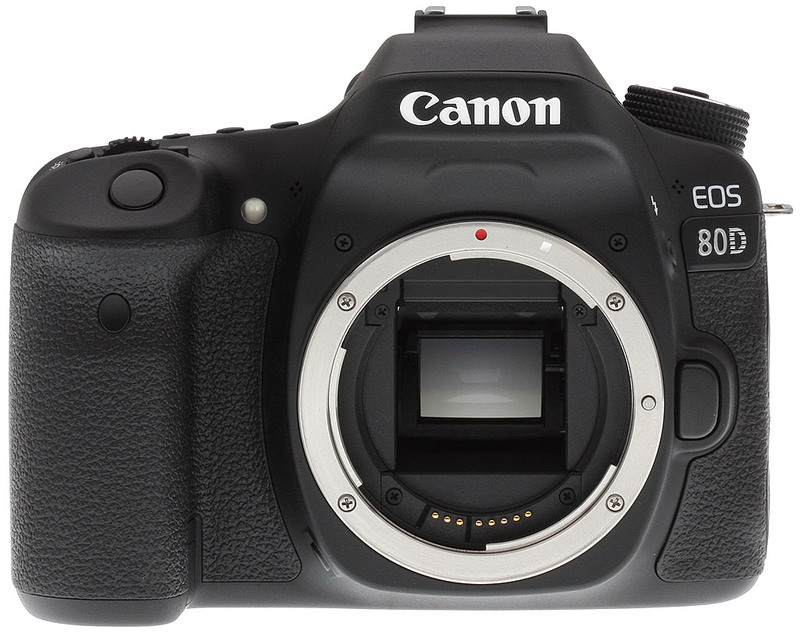 For power, the 80D uses an upgraded LP-E6N rechargeable lithium ion battery pack like the 7D Mark II. 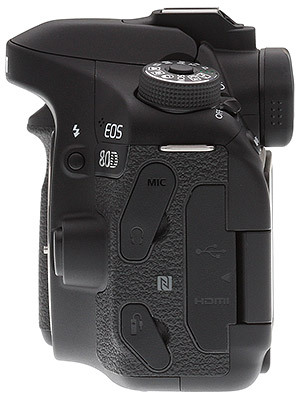 The 80D is, however, still compatible with the older, lower capacity LP-E6 from earlier EOS cameras, including the 70D. According to CIPA ratings, the 80D should last a healthy 960 shots on a full charge with the optical viewfinder, which is up from the 920 shots of the 70D and older LP-E6 battery. According to Canon's specs, the 80D should last around 1390 shots on a full charge when not using flash. With Live View shooting, as expected, battery life decreases noticeably, but the camera is still CIPA-rated for around 300 shots, up from 210. 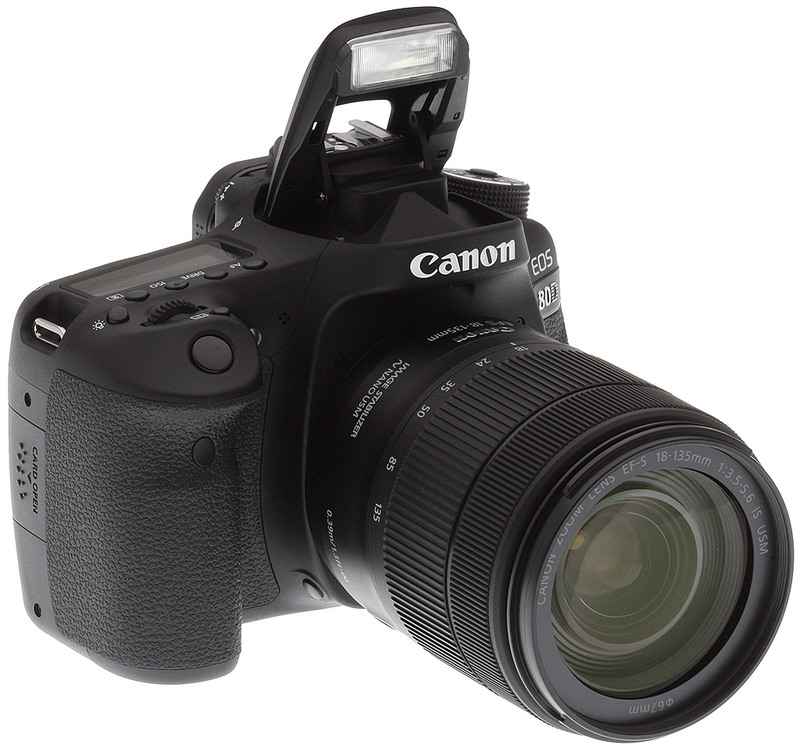 The camera is compatible with the same external battery grip as the 70D, and with dual LP-E6N batteries, and according to Canon, the 80D should offer up to around 2780 shots without flash and while using the viewfinder, which is rather impressive. As before, the 80D features a single UHS-I compatible card slot for media storage utilizing SD, SDHC and SDXC memory cards. Hitting retail shelves in March 2016, the 80D sells body-only for an estimated retail price of US$1,199 or with the new EF-S 18-135mm f/3.5-5.6 IS USM kit lens for US$1,799. 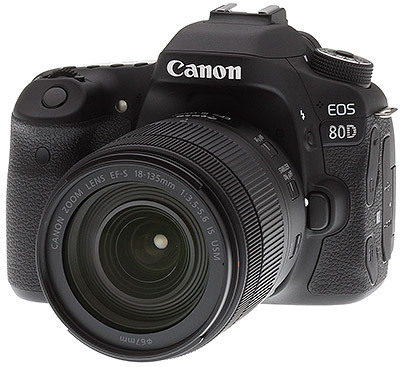 The 80D is also sold as a kit with the EF-S 18-55mm f/3.5-5.6 IS STM for for US$1,349. The new 18-135mm lens is also available for purchase by itself for US$599.99. The PZ-E1 Power Zoom Adapter and DM-E1 directional stereo mic are set to go on sale in June 2016, for an MSRP of US$149.99 and US$249.99, respectively. The 80D is, in general, an evolution to the revolution that was the 70D from 2013. 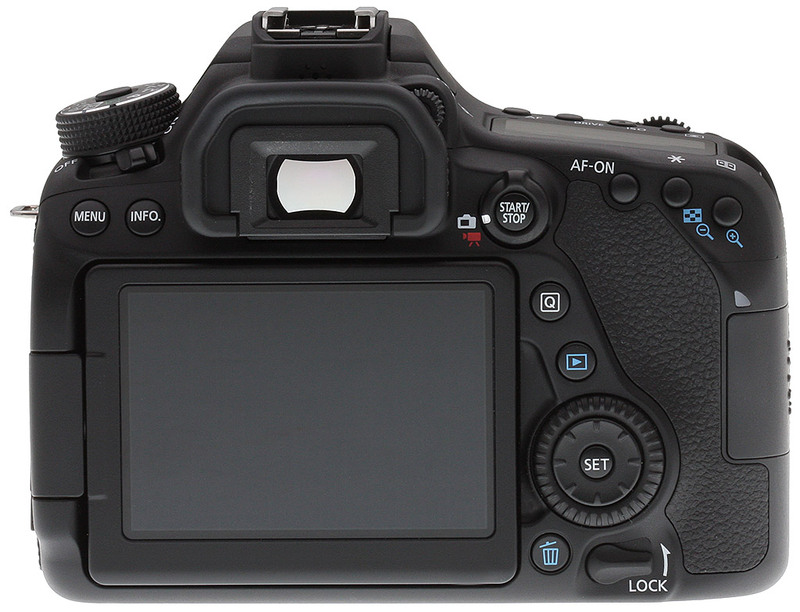 The predecessor brought about the introduction of Dual Pixel CMOS AF, which finally allowed a DSLR to autofocus in live view mode more or less like a mirrorless camera. Live view AF on the 70D was very fast and didn't hunt or wobble like contrast-detect AF live view focusing systems from other DSLRs. It also greatly improved Canon's AF performance with HD-DSLR video as well -- much better tracking of moving subjects and nice, cinematic focus transitions that were smooth and wobble-free. It's no surprise, then, that the 80D successor therefore includes Dual Pixel CMOS AF as well. With the newer 80D, there's now a higher-resolution 24MP sensor, upgraded image processor and an improved autofocus system, but the camera, overall, looks and feels very much like its predecessor. It's a fairly straightforward affair with the new EOS 80D: classic Canon styling and controls that are all familiar territory for seasoned Canon shooters, which in my opinion is fantastic. Placed between the more entry-level Rebel cameras and the more rugged, higher-performance 7D Mark II, the 80D sits in a comfortable middle ground with features and performance aimed at both advanced consumers and enthusiasts, as well as those looking for a solid array of video features and capabilities. Here we present crops from our laboratory Still Life target comparing 80D image quality to its predecessor, the 70D, as well as against a couple of enthusiast DSLRs, the Nikon D7200 and Pentax K-3 II, and a couple of similarly priced enthusiast mirrorless cameras: the Olympus PEN-F and Sony A6300. The 80D is the first crop-sensor EOS to offer the company's new Fine Detail Picture Style, so before we get into our usual camera comparisons, we'll first compare the default Standard Picture Style to Fine Detail at base ISO, then do our usual comparisons with other cameras using the default Standard Picture Style. But how does it do on paper? Making the jump from the 20-megapixel 70D to an all-new 24-megapixel APS-C sensor, the new mid-range 80D produces an impressive performance in the print department. Prints from ISO 100 - 400 look virtually identical with lots of fine detail and pleasing colors, which allow for very large prints up to 30 x 40 inches -- or however large you're willing to push the resolving power of the sensor. Towards the middle ISO sensitivity levels, the 80D still does very well at controlling noise and striking a good balance between NR processing and fine detail. At ISO 3200, the 80D manages a nice 13 x 19 inch print, and even at the top of the ISO scale, this new enthusiast DSLR achieves a usable 4 x 6 at ISO 25,600. What's there to say about the 80D? The camera is an excellent, well-built DSLR that produces reasonably sharp, detailed photographs and high quality Full HD video. It's comfortable to hold with classic Canon DSLR styling, ergonomics and controls, and its versatile AF system is great -- especially thanks to Dual Pixel CMOS AF. The 80D feels like a tried-and-true Canon DSLR -- nothing over the top, ground-breaking or revolutionary, just what it's meant to be. 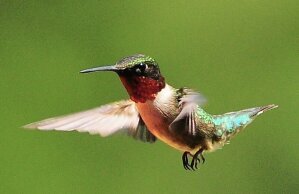 It's a straightforward camera that works well, performs well, and captures pleasing images. And for that, it gets our applause. But, the devil is in the details, so let's begin with the 80D's image quality. Overall, the 80D offers solid performance in the image quality department on nearly all fronts at both low and higher ISOs. The new 24-megapixel APS-C sensor now puts the 80D more in-line with a number of major competing APS-C cameras, and results in excellent, highly detailed images. Despite the increase in resolution, the 80D's new sensor also shows modest improvements with a higher maximum native ISO over the 70D, lower shadow noise, and improved RAW high ISO performance, but it still lags somewhat behind the best modern competitors, though. Large capacity SDHC/SDXC memory card. 16GB Class 10 should be a minimum..